Last Summer, we took part in a blog guest posting series over on Rainy Day Mum titled ‘Storybook Summer.’ Each week was a different theme and included a book pick that fit the theme and a craft to go along with the book. We chose to do the jungle week theme and picked a cute bedtime story to go along with it. I love it because it goes along to the tune of a catchy song. Head over to our guest post to see what book we chose! 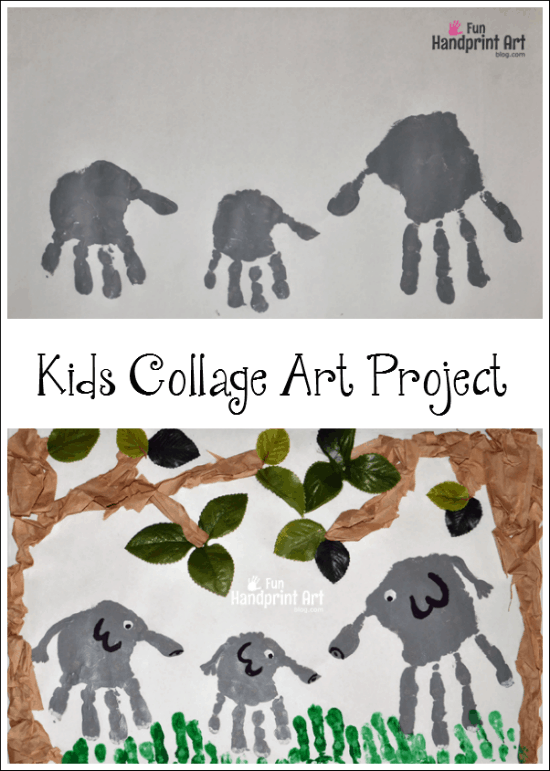 The craft we made to go along with it is a fun kids collage art project that incorporated a family of handprint elephants. I love the 3D look of it! 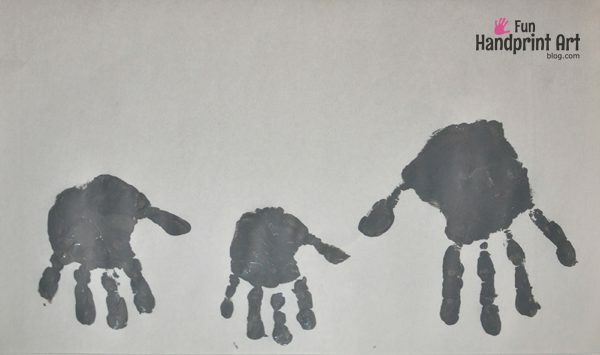 First, make prints of everyone’s hands. Our family of elephants includes myself, Big Brother, and Little Sister since my hubby was at work when we made it. 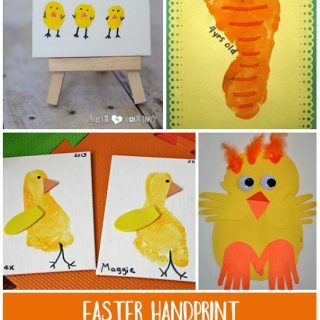 You will want to make the prints so the fingers are near the bottom edge of the paper. Add the tails and then let the paint dry. In the meantime, cut strips from a brown paper lunch bag. Let the kids have fun crumpling them. While they’re bust crumpling away, use white school glue to draw a tree outline on both sides of the paper. Fill in the trees with glue. 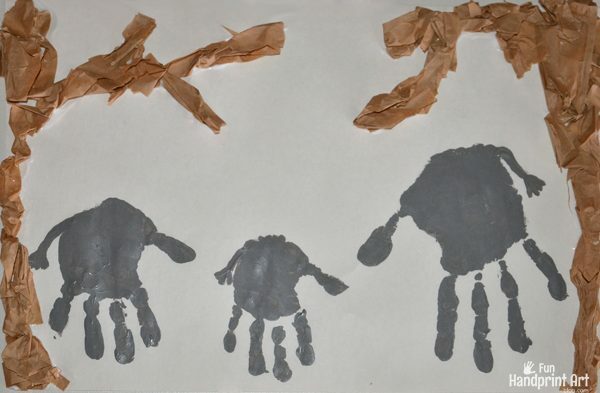 Ask the kids to place their paper bag pieces on the glue to create a tree. Use white paint to add dots for the eyes and toes on the bottom of the fingers. Outline the ears and nose with paint or a marker. Make a black dot in the eye when the white has dried. 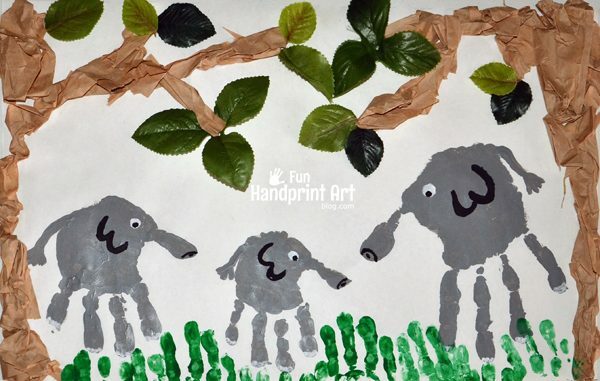 Make grass by painting just the fingers green and making prints along the bottom edge of the paper. All that’s left is adding in the leaves! 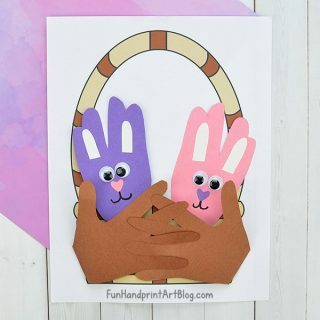 I happened to have fake leaves on hand, but you could easily use tissue paper, paint, or markers instead to create them. Don’t forget to head over to Rainy Day Mum to see what book we choose to read along with this fun collage art project! This is the cutest! 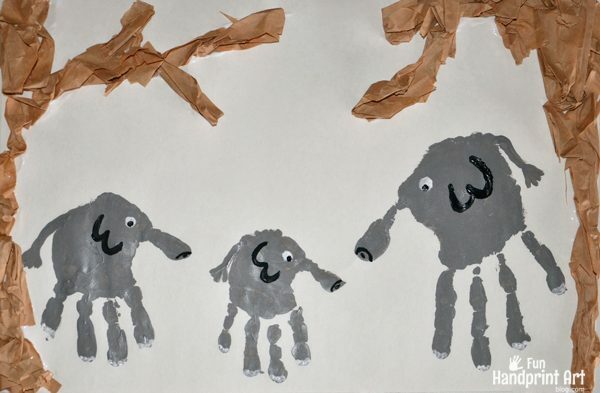 My girls favorite movie of the moment is Tarzan… they would be so excited to make elephants! This is so cute!!! DIG the scenery added to the hand craft!